Lama Acharya Gursam will be visiting the Florida Drikung Dzogchen Community from Monday27 October to Thursday 30 October. He will be offering two different teachings that are very central to practice in the Drikung Kagyu Lineage. On Monday 27 October and Tuesday 28 October at 7:00PM Lama Gursam will teach on the 37 Bodhisattva Practices. This text written by Ngulchu Thogme Zangpo, is an outline of the entire Buddhist path, and details the conduct of the Bodhisattva. On Wednesday 29 October at 6:30PM, Lama Gursam will offer the empowerment of Achi Chokyi Drolma, the chief protectress of the Drikung Kagyu lineage, and a dharma protector revered all throughout Tibet. Achi was the great grandmother of Lord Jigten Sumgon, the founder of the Drikung Kagyu lineage of Tibetan Buddhism. 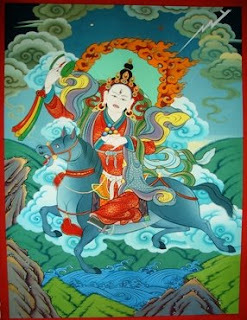 Achi is an enlightened dharma protector, and is considered an emanation of Tara and Vajrayogini. 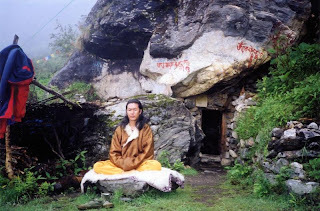 On Thursday 30 October at 7:00PM, Lama Gursam will offer teachings on the practice of Achi Chokyi Drolma. All teachings are at 1103 Hays Street. Directions can be found on the DDC Florida blog.